The Lady Eve's Reel Life: HAPPY HOLIDAYS! ﻿﻿One of the most charming and potent portrayals of Americana to grace the screen, Meet Me in St. Louis (1944) tugs at the heartstrings as powerfully today as it did 65+ years ago when it was crafted by MGM's "Freed Unit." The film's sparkling perfection is the work of producer Arthur Freed, director Vincente Minnelli, an incomparable ensemble cast, an ace artistic and technical team, songwriters Ralph Blane and Hugh Martin and...Technicolor. 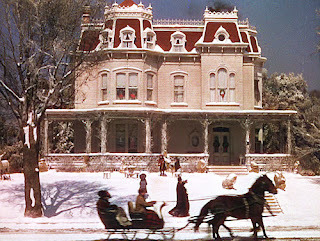 ﻿ ﻿ The Smith family home at 5135 Kensington Avenue (Sally Benson's real childhood address) was the film's central interior and Minnelli made the decision to build a continuous set with interconnecting rooms, just like an actual house. He reportedly wanted the entire picture to have the look of a painting by Thomas Eakins, and art director Preston Ames' assignment was to recreate a St. Louis neighborhood, circa 1904, as evocatively as possible. Ames did so, creating a full block of Kensington Avenue (at a cost of 200,000 1944 dollars) on Metro's back lot. Focused on the film's visual look and intent on accurate period detail, Minnelli supervised every aspect of set and production design. He brought in top Broadway set decorator Lemuel Ayres and, in addition, spent time with Sally Benson who described to him every feature of her girlhood home. To handle costume design, he turned to Irene Sharaff, another recent Broadway-to-Hollywood transplant. Sharaff researched the historic era carefully, even using a 1904 Sears & Roebuck catalog as a reference. Minnelli and cinematographer George Folsey took such pains with the film's colors and textures that some scenes do resemble period paintings. 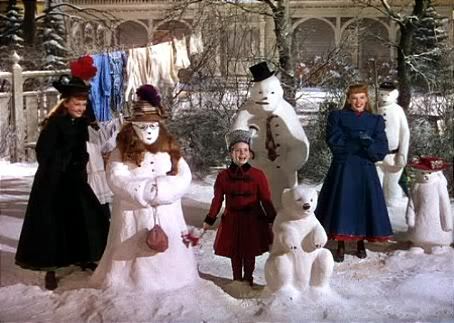 Meet Me in St. Louis was the first MGM film to be fully shot in Technicolor and Folsey and Minnelli proved to be adept at its use, even managing to capture subtle changes in seasonal light. The songwriting team of Ralph Blane and Hugh Martin composed three very special songs for Judy Garland: "The Boy Next Door," "The Trolley Song," and "Have Yourself a Merry Little Christmas" (click below to watch and listen). Each became a standard in Garland's later repertoire and "Have Yourself a Merry Little Christmas" remains a holiday classic today. To add more period flavor, Blane and Martin also reworked popular tunes from the turn of the century - "Meet Me in St. Louis," "Skip to My Lou" and "Under the Bamboo Tree." Up to this time, most films had music inserted arbitrarily, but the songs in Meet Me in St. Louis were integrated into the action and dialogue to help advance the plot. 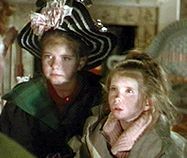 ﻿Margaret O'Brien as the high-spirited young 'Tootie' adds a dimension of childhood mischief and carries the imaginative Halloween sequence almost entirely on her own. She takes another precocious turn during the climactic Christmas scenes with Judy Garland. Leon Ames blusters as good-hearted family patriarch, Alonzo Smith. Mary Astor is light-as-air as 'Mrs. Anna Smith;' Lucille Bremer is winning as the older sister, Rose; Harry Davenport shines as lovable 'Grandpa' Smith; Marjorie Main adds spice as the cantankerous maid, Katie...and Tom Drake is affecting as 'boy next door' John Truett. Very fine in fleeting roles are Chill Wills and a young June Lockhart. This autobiography, "Hugh Martin: The Boy Next Door," covers a lot of years - Martin is now 96. The NPR/"Fresh Air" piece also includes a recent, shorter interview with Martin at the end (Blane is no longer living). Great post, Eve. It is a wonderful movie. You forgot to mention that it was Joe Cobb's last film. Of course he was in the Our Gang comedies, but here, at 28 years old, you probably couldn't recognize him. Thanks, Allen...I didn't forget about Joe Cobb, I didn't know he was in the film...thanks for pointing it out. Will keep an eye out for him when I watch "Meet Me in St. Louis" over the holidays. I have not seen this film in many years though I remember it well from my young years watching it with my parents on wintery Sunday afternoons. Sally Benson had an odd career from co-writing Hitchcock's SHADOW OF A DOUBT to Elvis' VIVA LAS VEGAS. Hi John...I hope you have a chance to see "Meet Me in St. Louis" again soon - maybe this year on TCM? I think Hitchcock knew what he was doing in selecting Thornton Wilder and Sally Benson to work on the screenplay of "Shadow of a Doubt," a story set in a small, very American town. Wilder had written "Our Town" and Benson's stories about St. Louis had already appeared in The New Yorker (the book and movie were in the works). As for her work on "Viva Las Vegas," all I can say is that Benson's screen work wasn't extensive, but it was very varied! Eve, a most enjoyable post with lots of fascinating background on a movie I am just as enthusiastic about as you obviously are. Every year on Christmas Day and New Year's Day I revisit a favorite movie I haven't watched in a while. Last year I went with musicals and watched "Singin' in the Rain" on Christmas and "Top Hat" on New Year's. This year's Christmas movie is going to be "Meet Me in St. Louis," and after reading your post I'm looking forward to it even more than before! great post eve...without ANY of the usual "blogger boilerplate"...great back story..this film came out at just the right time and was immediately embraced by the public and critics alike....they can not nor should they remake this!!!!! Your post makes me feel cozy and warm on a cold and gray day, and your description of the origins of MEET ME IN ST. LOUIS reminds me of the series of books written by Maud Hart Lovelace. The BESTY-TACY AND TIB books and the film are suffused with a quality of charm that makes me nostalgic for a childhood at the turn of the 20th century. The seasonal form of storytelling also evokes memories of those autumns and winters I spent in a climate where the leaves change colors and the snow falls over the Christmas holiday. 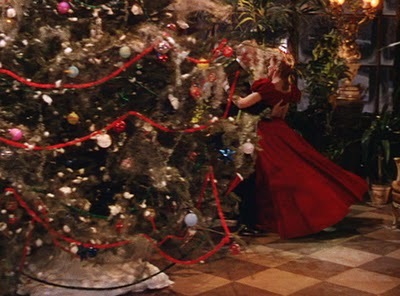 Few costume dramas that were filmed in Technicolor (the 1950s version of Little Women) have the same quality of charm, but I cannot think of MEET ME IN ST. LOUIS without the added sparkle of the color: Esther/Judy’s red velvet dress and her glittering scarf both perfect for the Christmas sequence. I am looking forward to watching this lovely film again on Saturday evening. This is one of my 3 most favorite movies...I haven't read the book for some time but as I recall Agnes was a much bigger character in the book, which was interesting. I think Joan Carroll's pitch-perfect performance is often overlooked because she's in the shadow of O'Brien. She's quite charming, and her line readings are perfect. ("Oh Rose, you're so stuck up!") There are also little things in the book that are only fleetingly referred to in the film...for instance when Grandpa says of Rose "The Queen has spoken," that has much more meaning if you've read the book. Ah, Betsy-Tacy and Tib...those who like the books might want to know there is a national Betsy-Tacy Society which has existed for many years! I met two of my closest friends on a discussion board about Betsy-Tacy on Prodigy back in the early '90s; one of them wrote THE BETSY-TACY COMPANION which tells you all about the books and the real-life people the characters were based on. Anyone who loves MEET ME IN ST. LOUIS would love the B-T books. Hi Laura - I haven't read the Sally Benson book or stories...but I did read that the original stories, being told from Tootie's point of view, did focus more on Agnes. Regardless of the size of her role in the film, Joan Carroll turned in a very fine performance. One of my favorite supporting players in MEET ME IN ST. LOUIS is Harry Davenport as Grandpa. Your mention of his line, "the queen has spoken," reminded me of how much he added to the film and inspired me to include this (cut & paste) link to a "Films of the Golden Age" piece that covers his 78-year career before and after, at age 69, "...he packed his belongings in his decrepit car, locked up his home, and set off alone for Hollywood." This is the movie that got me interested in Classic movies. I love everything about it, the scenery, costumes, actors and story line about learning life lessons. If you were to ask me which is my favorite part of the movie. I would have to say Halloween when, Tootie and her sister Agnes dress up and go out to celebrate Halloween with the neighborhood children. Wanting to prove herself to the other children, Tootie, insists on going up to the feared neighbor Mr. Braukoff door, and blow flour in his face. After Tootie is called the "most horrible," she puts her family into a panic when she returns home, crying, bruised and with a cut lip. Eve, this is a wonderful article on a movie I have always loved so much. I learned some interesting facts about it that I did not know, and your description of the film was right on the nose. It's the best of Hollywood, to me. Thanks for a really excellent write-up! Just finished watching this and enjoyed it completely. Pure Americana, visually stunning! Minnelli's use of color is like an artist's palette, and Garland's voice is a treasure. I do wonder if an America like the one portrayed here though ever really existed. Even if it didn't it is nice to believe that it once did. Thanks for the "nudge" to take another look at this. And John, so glad you enjoyed "Meet Me in St. Louis"...I agree with you 100% on all counts...the turn-of-the-century America it depicts may be fanciful, but, as you say, nice to believe in. I love this movie and even made it the project of one of my film studies classes at university focusing in on the "Have yourself a merry little Christmas" snowman massacre scene. I read all of the New Yorker short stories and yes it is Agnes not Tootie who does most of the actions ascribed to Tootie in the film. I have always loved the film and the dress Judy wears in the Have Yourself a Merry Little Christmas scene and have wanted to pay to have it made for me since I was about 8.